A Business Engineer is a hybrid between a business administration and technology expert, a person with the business acumen and engineering abilities to understand a complex organization and devise solutions and work as a liaison between commercial and technical teams. At its core, a business engineer is a hybrid between a business person and an engineer. The business engineer is someone with the understanding of how the business world works ad macro level, combined with how organisms function at a micro level, that can architecture solutions based on several key elements. Business engineering is a discipline in between business administration and technology. As more and more organizations are innovated by combining technological product and processes with remixing old and new business model patterns, it becomes critical to understand and drive those processes. A business engineer is a hybrid between a commercial and technical role. It can work as a liaison between commercial and technical teams to device complex solutions to its organizations or other companies for which the business engineer partners with. 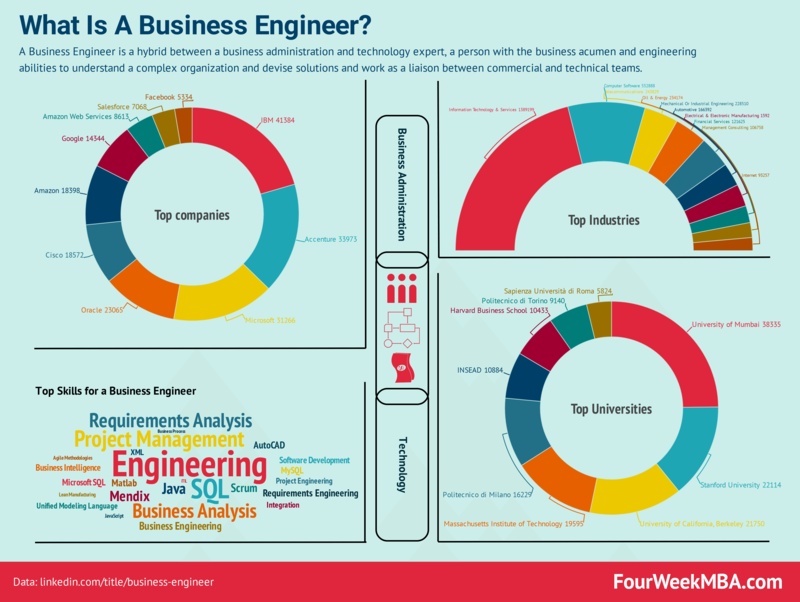 What tasks a business engineer performs? Developing sales and service with regional and global accounts, supporting Account Managers and business development. Driving sales-related activities, implementing customer projects such as product and prototype selections, costing, pricing, quotations, preparation for serial production, and logistics setups. What kind of background, education, and experience do you need to become a business engineer? Bachelor’s degree in Mechanical or Chemical Engineering or comparable technical field. Advanced Microsoft Office with an understanding of calculation tools. Those, of course, are just some of the skills required. Those will widely vary from organization to organization. How much does a business engineer make? According to PayScale, the average yearly pay for a Business Engineer is $67,429. The total pay goes from $35,479 – $83,845 based on salary and bonus. By running a search on Glassdoor for Business Engineer, the average salary can go from $64k per year for smaller organizations to senior Business Intelligence Engineer at eBay and Facebook, for $117k and $140k of yearly base salary respectively.